IDF soldiers have arrested two PA Arabs from El-Bireh in connection with the shooting of a nine-year-old in Psagot. 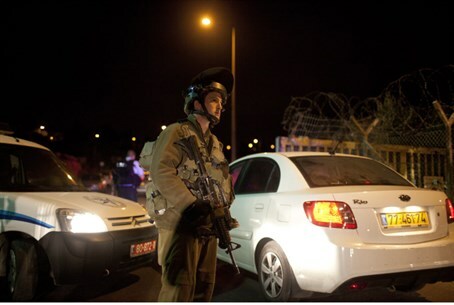 IDF soldiers carried out an arrest operation in the Palestinian Authority Arab village of El-Bireh on Monday evening, PA media reported. El-Bireh is located next to the Binyamin region community of Psagot, where a terrorist shot nine-year-old Noam Glick in the neck at short range on Saturday night. According to the PA report, the Israeli troops arrested Alaa and Fares Adawi, two brothers aged 25 and 26, on suspicion of involvement in the Psagot attack. The report added that local Arabs rioted as the two were being arrested. The PA has failed to condemn the attack in Psagot, nor has it condemned the murders of IDF soldiers Gabriel (Gal) Kobi and Tomer Hazan. At a meeting with leftist MKs Monday, PA Chairman Mahmoud Abbas would not condemn the recent attacks, as is his obligation under the Oslo Accords. He did say, however, that he condemned “violence on both sides,” adding that he believed Israel and the PA could achieve an agreement in a matter of months. On Sunday, an official Facebook page run by Abbas’s Fatah movement praised the terrorist who shot Noam Glick, and predicted he would strike again. Fatah official Jibril Rajoub said on Sunday that he condemns the terror attack in Psagot, but placed the blame for the attack on the Israeli government.